When I first started writing for the Royal Scottish Geographical Society, I had barely heard of a tenth of the extraordinary people whose stories are bound up in their archives. I had certainly never heard of Mildred Cable, or Eva and Francesca French. I imagined that they would be scientists rather than explorers, but I was in for a big surprise. Not for the first time, I was touched and captivated by their story of exceptional courage. In 1943, when these three ladies received the Livingstone Medal of the RSGS, Mildred was 65 while the Misses French, who were sisters, were well into their seventies. As single women and Christian missionaries their lives had been bound together so strongly that they were inseparable. They called themselves ‘The Trio’, and in their younger days they crossed and re-crossed the deserts and plains of Western China. Hundreds, if not thousands, of Chinese villagers knew them as kind and patient teachers, but put them in the same room as a power-crazy warlord and they soon unleashed their hidden dragon. Mildred, Eva and Francesca are included in my new book, ‘The Great Horizon’, and I very much hope you will enjoy reading about them. Meanwhile, I thought it would be interesting to take each of them in turn and tell you about their early years, because their childhood experiences had a great impact on the rest of their lives. The daughter of a draper, Mildred was born in 1878 in Guildford, Surrey. To say she had a strict upbringing would be a gross understatement. As a means of ensuring good behaviour, her governess terrorised her with threats of a vengeful God, which were so effective that the little girl was afraid to go to sleep in case she died and went to hell. Books of fairy tales were removed from the nursery, so that they did not pollute her mind with romance, and all pleasure was strictly banned. I would love for Mildred to have been a rebel, and run off with an entirely unsuitable young man with no money. But her life went another way entirely. While she was still a child, she had a dream that reassured her of Christ’s love, and it was so enlightening that it stayed with her all her life. 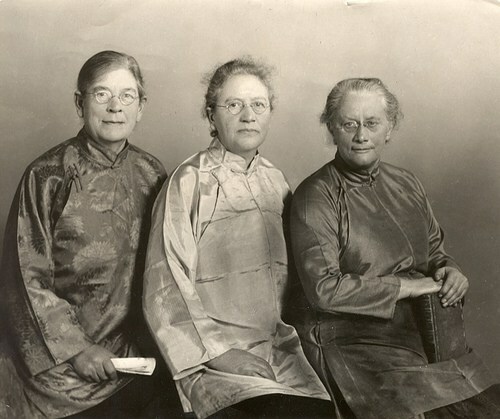 Later, while studying science at London University, she was drawn to attend Evangelist meetings, and she volunteered for the China Inland Mission which was actively recruiting new missionaries to be sent to Shanghai. 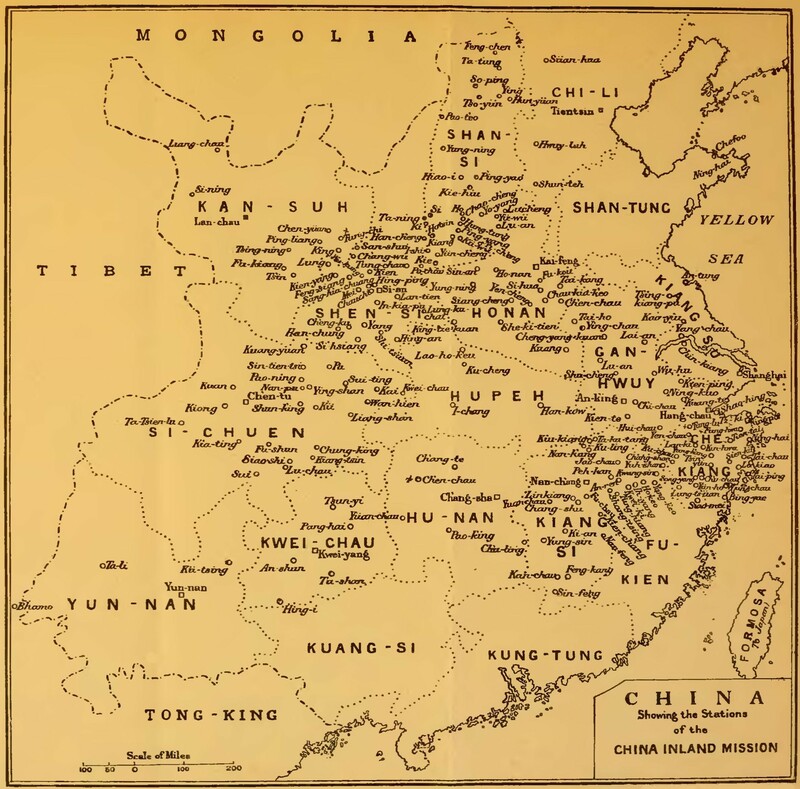 Mildred fell in love with a young man who was also training to be a missionary, and they become engaged; but in 1900, when news reached Britain of the Boxer Rebellion*, in which hundreds of Christian missionaries and converts were being massacred by extremists, it was considered far too dangerous to travel to China. Mildred was disappointed but philosophical: she knew that the time would come when it would be safe for her to go there. Her fiancé reacted differently to the crisis. Having abandoned his plans to be a missionary, Mildred’s fiancé wrote to beg her to do the same. Reading his words with dread, Mildred realised that she must choose between her love and her faith. In that hour, she felt as if “the brightest things of life burnt themselves to ashes.” But she never allowed herself a moment’s hesitation. She would not marry him. She continued to plan her future with a broken heart. On 25th September 1901, Mildred set sail from Liverpool, travelling with her father as far as North America and then voyaging on alone across the Pacific. The situation in China was generally believed to have settled down, although there was still great hardship in the rural communities. Emotionally, she had drawn a curtain over her past. She forced herself to look only forward, to a life devoted to serving others and spreading the word of the gospels. When she alighted from a dusty mule cart outside an inland mission station, a woman came down the path to welcome her, smiling warmly while scanning her face; many trials lay ahead, and this newcomer looked frail and vulnerable. The woman who greeted Mildred was Eva French. Born in 1869, Evangeline (‘Eva’) French was the second daughter of John Erington French and his cousin Frances Elizabeth. She seems to have been fiercely independent and strong-minded almost from birth. Adventure was in her soul, and there was nothing that she dared not do. Aged six, on her first day of school in St Omer, France, she somehow escaped from her teachers and managed to climb up onto the high wall of the school enclosure. She paraded there triumphantly in front of a row of anxious black-robed convent sisters, all beseeching her to come down. Mutinously, Eva refused to yield until certain promises had been made, chiefly concerning the supply of chocolate and a complete amnesty from punishment. Eva’s appetite for risk was so great that, as she grew older, her parents had to bring themselves to a decision: they had three daughters, and they agreed that no other lives should be endangered while attempting to rescue her. Meanwhile, Eva continued to invent new reasons for acute anxiety. Walking by the shore of Lake Geneva, for example, one winter’s night, she darted away from her family and clambered onto a pier that had become so encrusted with ice that its surface was concave and perilous to walk on. She vanished into the darkness for more than an hour. Her family knew that no threats or entreaties would bring her back, so they had little option but to wait until she blithely re-appeared, triumphantly carrying an armful of sword-like icicles. Eva was a young woman of startling contrasts. In Geneva, where she was educated, she immersed herself in a frothy round of balls and parties, dancing until dawn and then composing herself for lessons without any apparent loss of energy. She loved life, but something in her nature was also drawn towards darkness. In the late 1800s Geneva was a refuge for Russian political offenders, and nihilism was flourishing among University students. Eva devoured Russian literary works and pronounced herself, among other things, to be “the fervid Nihilist, the incipient Communist, the embryonic Bolshevist.” She was passionate, intelligent and impressionable; she felt the suffering of the world and she wanted to save it, or die trying. Her family’s decision to move to a small village in the south of England was not a happy one for Eva. Like a moth in a jar, she felt imprisoned by the restrictions of Victorian society, and in return she was regarded as an eccentric, even a revolutionary, by her neighbours. But it was in a little English church that her life changed forever. She later recalled that, in a moment of enlightenment, the preacher, the choir and the congregation simply ceased to exist, and she felt herself to be “alone with Christ”. Always direct and honest, she went home and told her family that she had found her calling. In 1893 she boarded a ship bound for Shanghai, to join the China Inland Mission. So it was that, when the Boxer Rebellion began, and while Mildred Cable was still in London mourning her lost love, Eva was already in China, facing imminent execution. Francesca, Eva’s younger sister, was born in 1871 in Bruges. She was a reluctant participant in many of her sister’s escapades, but miraculously she survived. By nature she was quieter than Eva and more responsible; she applied herself more diligently to her studies, and when her family moved to Geneva she revelled in its sophisticated culture of music and the arts. Outwardly she appeared happy, but in her personal relationships she was as repressed as Eva was demonstrative. She read the works of Charlotte Brontë, and felt a kinship with her tortured heroines who were unable to express their true nature. Francesca embraced discipline and self-denial, and although she attended concerts and operas she avoided social gatherings where the frivolity seemed to have no purpose. I can’t help feeling sorry for Francesca, although she would certainly not have sought sympathy herself. She seems to have been deliberately avoiding the dramas created by her sister, over-correcting her behaviour so that she was virtually invisible. When the family moved to England she involved herself in the activities of the local church, and soon developed a reputation for righteous devotion that was remarkable even by the prim standards of her day. Duty was transformed into inspiration when she went with Eva to an Evangelist meeting. By then, Francesca knew that she, too, wanted to become a missionary, but while Eva set sail for China, their mother’s frail health required Francesca to stay at home. In the summer of 1900 the newspapers were full of the atrocities of the Boxer uprising, and Eva was among the hundreds of foreign nationals reported to be murdered. The China Inland Mission offered as much support as possible, but for Francesca and her family the shock was almost unbearable. Francesca found it impossible to express her anguish, and her mother sank into a deep despair. Several months later, a telegram was delivered to their home. Trembling in disbelief, Francesca read that her sister was still alive. Although relieved beyond words, Francesca’s mother never fully recovered from the ordeal, and Francesca nursed her until she died. Afterwards, aged 34, she allowed herself a few quiet months to grieve, and then she packed her belongings to begin a new life on the other side of the world. Mildred Cable and the Misses French were guests of the RSGS on several occasions, illustrating their lectures with slides that showed the fascinating and little-known landscapes through which they travelled. I describe some of their adventures in my new book, ‘The Great Horizon’. What wonderful characters! I’m so glad they will be included in your book. I’ve sent my information to the RSGS. Hope it will be coming out soon. I know, Pat – these women were unstoppable, and I loved reading about them. I was really touched to discover their reasons for becoming missionaries. Thank you so much for ordering a copy of the book – due out in the autumn, and I’ll post updates here when I have them. Still at the editing stage at the moment, but progressing well! What an intriguing trio, that’s a wonderful photograph of them. I very much enjoyed this post and look forward to reading more in the book anon. Thank you so much, Lorna! Yes, I love that photo – they look such characterful ladies. You feel as if you can see a lot in their faces.